CS Sicily Kariuki launches NYS programmes in Kitui – Kenyatta University TV (KUTV). All Rights Reserved. Public Service, Youth and Gender Affairs Cabinet Secretary Sicily Kariuki arrived in Mutomo in Kitui South Constituency to launch the launch NYS youth empowerment programme. The CS was received by area MP Rachel Nyamai , Kilome MP Regina Ndambuki , County Commissioner Boaz Rotich among other county leaders. 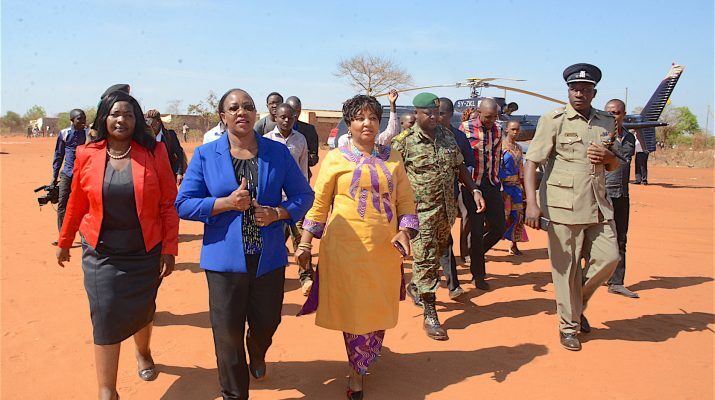 According to the CS when she launced the the Youth Empowerment Programme on Monday in Kitui South, Makueni and Machakos constituencies, the programme will focus on infrastructure and environment projects. “We’ll be working on access roads and the rehabilitation of a dam to improve water supply,” Kariuki said in Kasikeu Boys School. “We’ll also have youth in environment management with respect to keeping roads and town centres clean,” she said. Kariuki was with MPs Rachel Kaki and Regina Ndambuki. The programme will be rolled out in 15 new counties in two weeks. The CS disbursed more than Sh12 million under the Affirmative Action Fund to 2,154 residents in Kitui , Makueni and Machakos.